Restored XK8 How old does your car need to be for restoration? 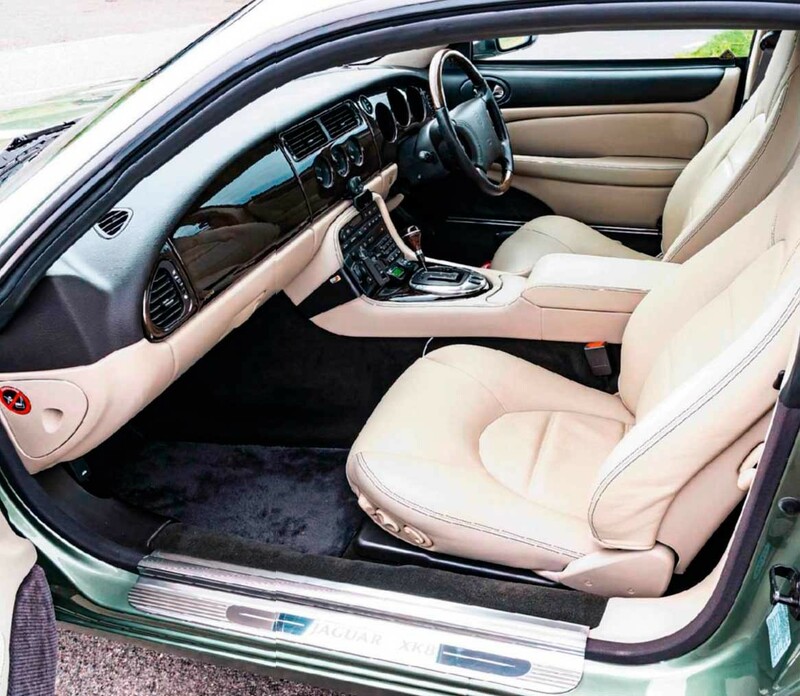 We ask the owner of an X100 why he comprehensively restored a car that is a mere 20 years old. Digging deep. When Nigel Paines bought his early XK8 it looked to be a good, clean example – but the shiny Alpine Green paint hid the many horrors that lurked beneath. Despite its potential value being nowhere near that of an E-type, Nigel has still treated his car to the same high level of restoration. Words Richard Bremner. Photography Antony Fraser. RESTORATION 1998 JAGUAR XK8 4.0 X100 An incredible no-expense-spared restoration of an X100 XK8. Restoration. Sometimes it makes financial sense, sometimes it makes no sense at all, but, either way, there are plenty of cars that are restored regardless of the sums. That’s as it should be because for most of us this is a hobby, and hobbies often cost. Cold hard cash takes no account of the sentiment behind some back-to-base-metal mechanical adventures, either. Nostalgia, associations between this particular car and your past, or the simple, long-held desire to own a particular car can all trigger a classic acquisition. Sometimes, the newly acquired car will have been bought as a project, more often as a running car that can be used straightaway. 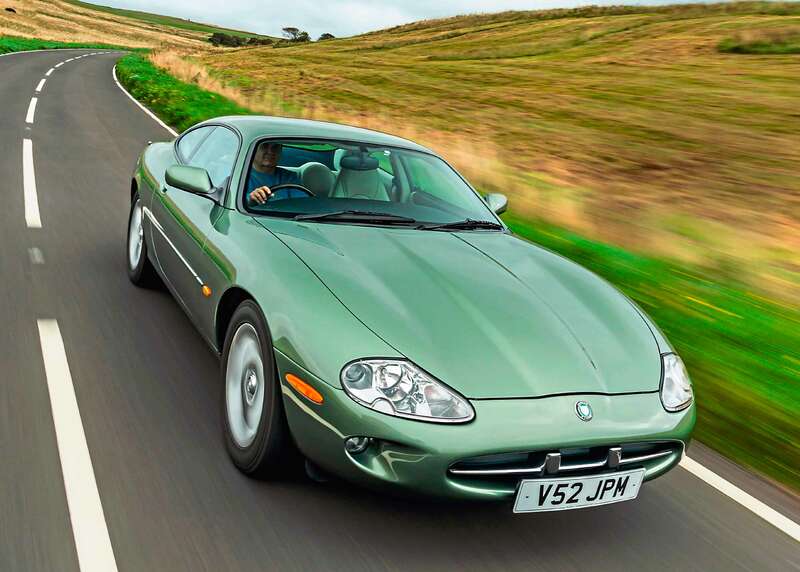 That was what Nigel Paines thought when he bought an early XK8 coupe in tidy, low-mileage condition and in a rare and deeply appealing colour called Alpine Green. Look at the pictures of the car as he bought it and as it is now, and you’ll struggle to see much of a difference, apart from hints of today’s deeper sheen. XK8s hide their problems well, Paines discovered, looking at plenty before settling on this one. “Even when I bought it, I knew there was a fair bit of work to do.” he adds. If you were to examine this XK8 in before and after conditions on a ramp, your view would, indeed, be coloured differently. In the case of the before image you would see quite a bit of brown and flakey underpaneling, an exhaust system bleeding rust from its seams, dirt-coated suspension arms lightly scabbed with rust and, in a few areas, metal deeply browned with rust. Which isn’t entirely surprising. When refurbishment work started on this car in 2016 it was already two decades old. Although a low-mileage XK8, it had spent its life-to-date being used as an ordinary – if cared-for – car. The fine condition of its visible panels and the interior did little to indicate the degradation that its underside had already suffered. What came next will be familiar to anyone who has restored a car themselves, had it restored by someone else or read about restorations. And that is this car needed a load more work than a swift inspection tour of its bottom half could ever reveal. Paines entrusted the early dirty work to AJ Barnard Engineering of Bodiam, Kent; these highly experienced Jaguar specialists are an outfit he would come to know very well. The further they dug, the more digging was required, with many of the bulky components bolted beneath hiding more corroded monocoque. Soon, it became apparent that the only way to do the job properly was to take much of the car apart – the removal of the exhaust, the drivetrain, the suspension, the subframes, heat-shields and a heap of grommets, clips and fixings allowing the full extent of the decay to be exposed, and a pathway cleared for its renewal. Ultimately, the only major item left in place was the dashboard, and Paines muses over whether it might have been worth removing that, too. At which point you might be wondering whether the task was worth it. XK8 values might be rising a little now, but they weren’t when Paines had got to this point. 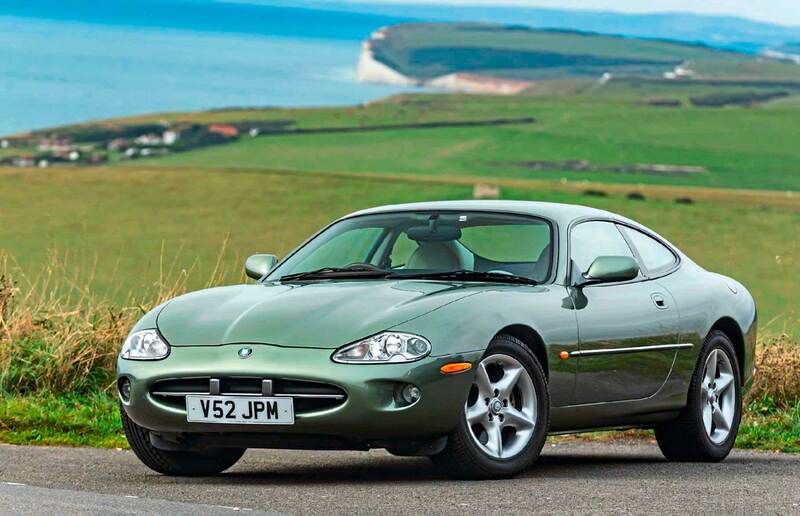 More than that, XK8s aren’t rare, and newer ones, you’d assume, might be usefully less ravaged. Restoring an E-type in this state, or worse, can still make sense if you’re able to fund it. Pick the right model and, with luck, it will be worth more at the end of its revitalisation than will have been spent on it. But there’s nothing like this financial safety margin when you’re restoring an XK8, which can swallow equally large mounds of cash and leave you well under water. But, as Paines says, “You get in so deep that you have to carry on. The project gathered pace, but I didn’t realise it would be as much work.” The Jaguar’s dismemberment certainly allowed the crumbly sections of its body to be cut out and replaced. These zones included sections of its sills, large chunks of the floor behind the rear wheels (these double-skinned panels particularly vulnerable), the front cross member and its surrounding constructions, and even a chunk of a front longitudinal. Paines was able to mitigate a little of the cost by doing some of the work himself. 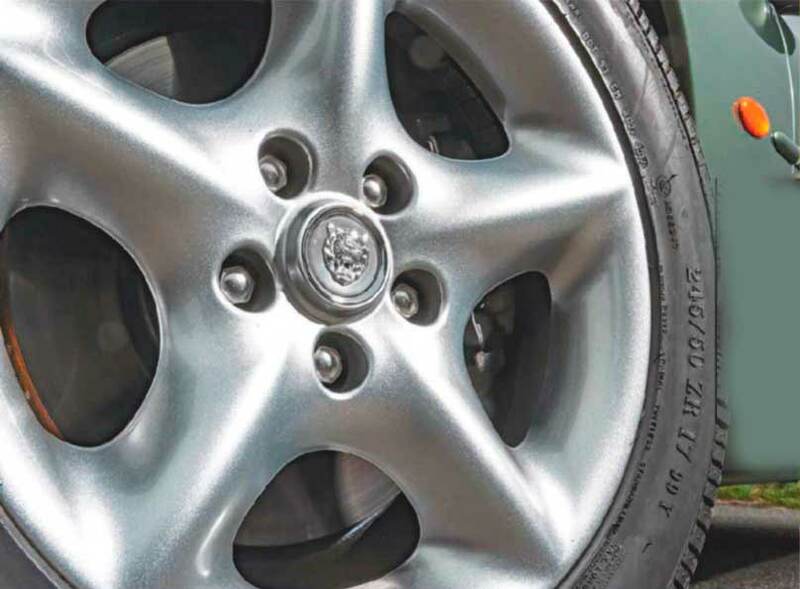 “All the underside was meticulously cleaned by me using brake cleaner. I worked section by section, and then it had three coats of primer.” Paines says that he found this work to be hugely satisfying, not only because he could see the results of his work, but also because he became more emotionally invested in the project. Which was just as well, because this was going to be about rather more than reconstituting some sills. Corrosion was found in sections of both sills, and one wheelarch lip at the joint where outer wing meets inner. These repairs were carried out before the floors were cut out in order to preserve the Jaguar’s dimensional accuracy. Although most of the visible exterior panels were intact, enough of the XK8’s surface was disturbed to make a repaint desirable. With a good deal of the car apart, Paines was only one step away from a full screens-out bare-metal respray, and, as you may have guessed, it was a step he took. All the Jaguar’s glass was removed, together with its rubber seals and the remaining hardware attached to the outer body. Not that there was much of this left, the bumpers, lights and closing panels having long since been taken off. Removing every milligram of the Jaguar’s paint may sound like an extreme next step, but you can, at least, be sure that every scab of corrosion will be uncovered and that the car will receive the same primer and paint treatment throughout. This work was performed by Kingswell Coachworks in Battle, Kent, and to lustrously good effect. Keeping the car standard was a major goal for the project, “Otherwise, you end up with just another hot-rodded Jaguar, and it won’t be worth as much,” he adds. That said, Paines allowed himself some minor deviations from specification, notably with the installation of a custom-made stainless steel exhaust system. Apart from being more durable, it allows the V8 to sing a little more loudly under power, besides eliminating the restriction imposed by the factory system when its steel pipes looped over the rear suspension, these bends impeding its flow. The system was made by Zero Exhausts, and looks impressive once installed. Paines also wanted to equip his XK8 with some options it missed out on when built. Cruise control went in – this car’s new life is as a long-distance touring machine – as did a passenger seat height adjuster. The driver’s seat runners were lengthened, too. Also fitted, were rear parking sensors that have a clever aftermarket system using a silver foil reflector bonded to the rear of the bumper. That way, no unsightly holes are required, and the system is wired via the reversing lights. “It works perfectly,” says Paines. 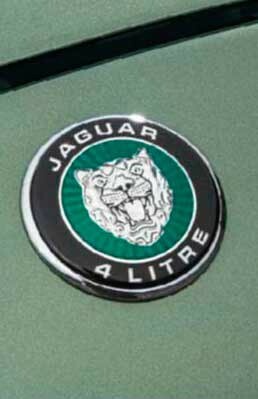 Bluetooth connectivity is provided by a removable Parrot device mounted on the centre console, while tyre valve-maker Schrader helped Paines unearth an aftermarket system to monitor the Jaguar’s tyre pressures. “It even monitors the spare,” he says. All of these mods improve the car’s convenience, and all are easily reversed. The engine and gearbox were left in Browns Lane trim and, probably of great relief to Paines, needed very little work. Being an early XK8, his car has the very durable (when they’re not fed excessively sulphurous fuel) Nikasil-coated cylinder liners, refurbishing being limited to a new set of timing chains, the fitment of the tougher metal tensioners rather than the early plastic variety, a new water pump, new belts, and new coolant and heater hoses, plus new sensors that as Paines wryly points out, are a hell of a lot easier to change with the engine out and on the floor. 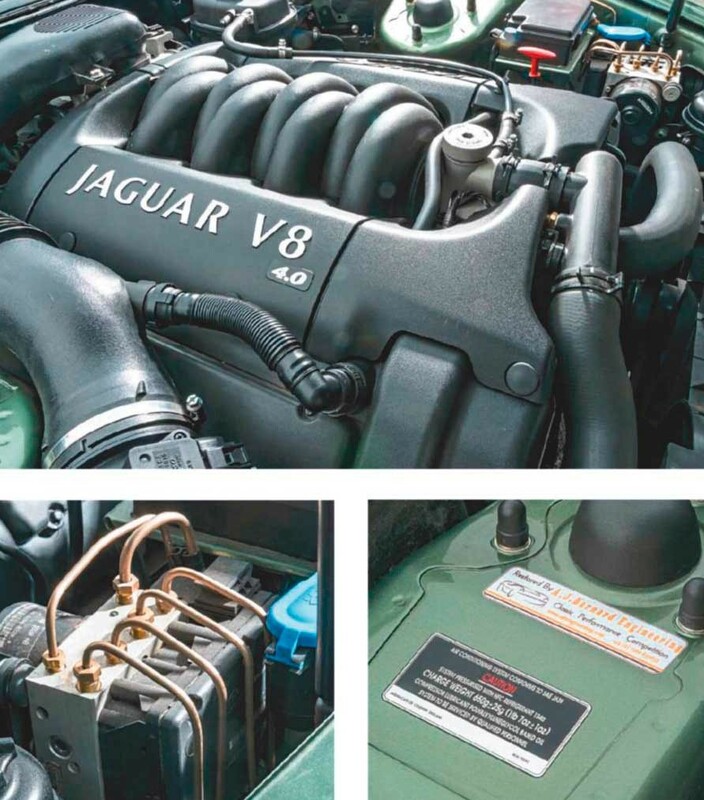 The coil packs, radiators, brake lines and alternator cooler were renewed, an oil cooler was added and the air conditioning compressor and pulleys were overhauled, too, all of this work designed to ensure long-distance reliability. The so-called ‘sealed-for-life’ gearbox was also checked over and, happily, declared fit by Auto Gearbox Specialists, in Hailsham, who serviced it too. But one baffling mechanical challenge, says Paines, was to make the Jaguar-supplied cruise control work. After much diligent searching, he discovered that a switch in the brake pedal sub-assembly needed to be changed, after which it worked perfectly. Getting involved like this can turn frustration into a pleasure that’s all the greater when you’re contributing to the rebirth of your own car. 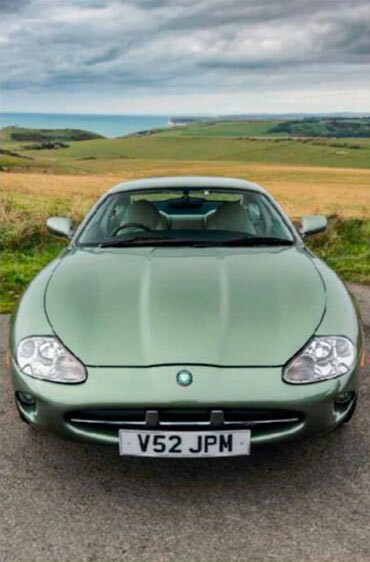 Other challenges included some spares no longer being available, among them various bumper support brackets, the rubber seals at the tops of door windows and the pollen filter casing, an option this XK8 didn’t come with. Breakers’ yards didn’t yield one either, suggesting it was a rare option, so one was fabricated instead. Paines reinstated much of the interior, but not before applying Dynamat sound-proofing pads to the roof and door interiors, while the front seats, which had oatmeal cloth inserts, were part-retrimmed with ventilated leather inserts by Aldridge Trimming, oatmeal of the correct weave being unavailable. 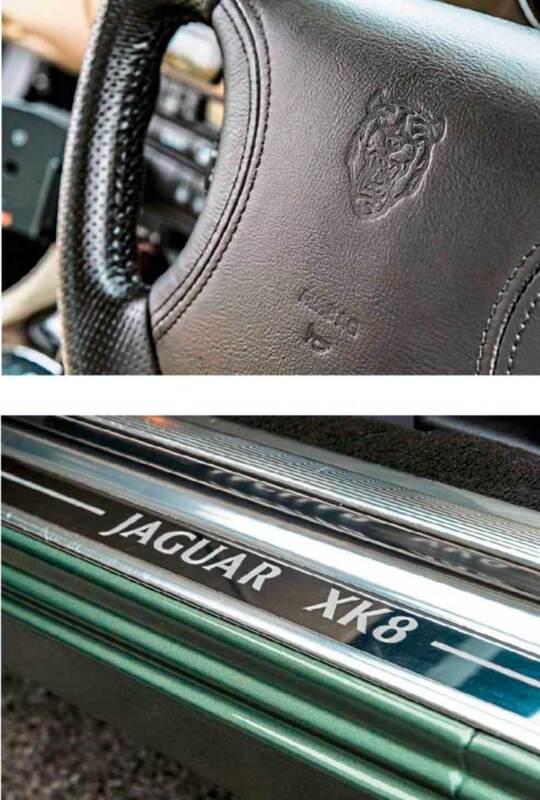 Other new items included the headlining (it is an ageing Jaguar, after all…), the dashboard bulbs, the steering wheel, which was replaced with a new old-stock item complete with airbag, and the rear high-mounted brakelight, again in the quest for dependability. Paines couldn’t resist deep-pile dropin floor carpets (“One of the last sets available,” he tells me). You can’t say that he hasn’t been thorough. And that thoroughness is reflected in the way this Jaguar drives, as you’d hope following such huge effort. 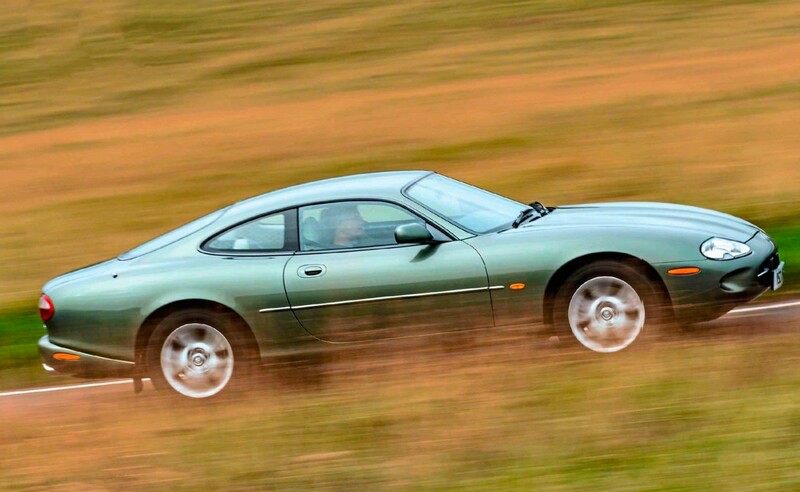 Despite having been apart, it drives as a good XK8 should, mixing taut, responsive handling with a plush ride, and plenty of quiet – especially with the extra sound-deadening. The V8 is more vocal under acceleration and the more pleasurable for it, but turns quiet at a cruise, as it should. The only blot is a slightly clunky differential, which will doubtless be dealt with in time. It is a surprise to discover how well this car resists understeer, and the way it attacks bends with a high-precision zeal that’s surprising in a car so sumptuous and civilised. 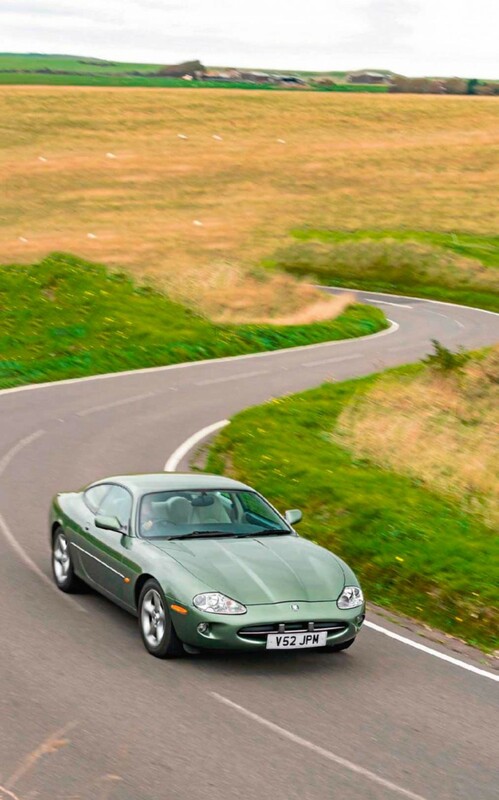 It is this refined agility, and the XK8’s timeless styling, that drew Paines to it because he wanted a car for long-distance holidays. “You really understand what a GT is when you drive one of these,” he says. In fact, this revived XK8 has just completed its first, to Italy and back, the near-3,000- mile trip proving satisfyingly trouble-free. There are no regrets, then, and when you look at this car and its striking paintwork, you can see why. This XK8’s condition was worse than expected, yet, says Paines, “What I also didn’t know was what an interesting and rewarding journey it would take me on.” Restoration, of course, is a trip in itself, and usually at least as enjoyable as driving the end result. Perhaps better still (and good news for Paines) is that interest in XK8s – and their consequent values – are now rising. 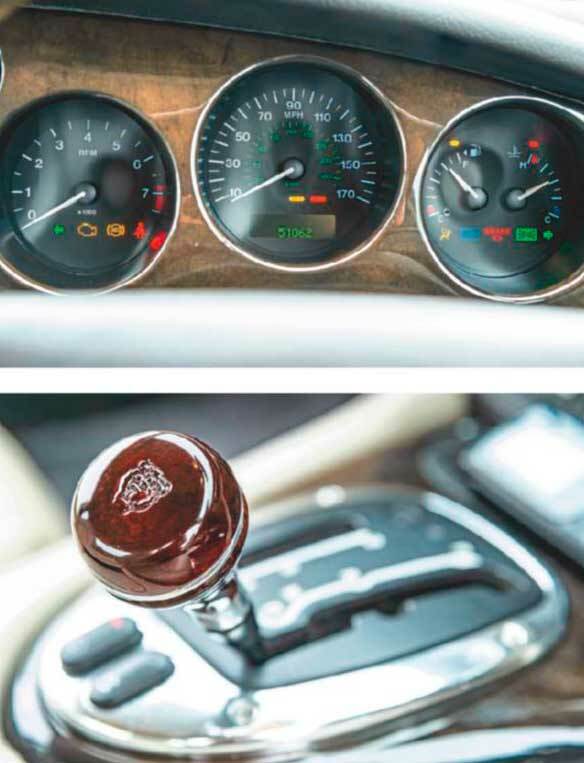 LEFT: Other than longer seat runners and walnut gear knob (above), the interior was kept largely original. The high standard of the cabin’s finished is helped by the new deep pile carpets. TOP: The 4.0 V8 needed very little work. The refurbishment was limited to a new set of timing chains, the fitment of the tougher metal tensioners, a new water pump, new belts, new coolant and heater hoses plus new sensors. Bonnet off, wings off, bumpers off, suspension off, engine out – all this, and more, needed to access rust. Luckily, the welded joint of only one wing to inner wheelarch needed this extensive surgery to cut out corrosion. The rear axle assembly was dismantled and all suspension arms blasted and epoxy coated. The primer goes on for the full, glass-out repaint, in rare Alpine Green. Alloys also refurbished, shod with fresh Pirellis. The transmission tunnel from below, naked. The surface rust visible here ran much deeper elsewhere. The semi-stripped XK8. The powertrain and every ancillary would eventually come out, to be refurbished or replaced.